The report into the removal of two Roma children from their families last year has been described as “shocking”. Emily Logan and Frances Fitzgerald at the launch of the report today. THE LOGAN REPORT into the removal of two Roma children from their families in October 2013 should act as “a wake up call” for Ireland’s child protection and welfare system. That’s the view of the Children’s Rights Alliance (CRA) – one of the many groups reacting to the report’s publication this evening. Children’s Ombudsman Emily Logan examined the cases of two Roma children – a 7-year-old girl and a 2-year-old boy – and found that their removal from their families was in line with “ethnic profiling”. 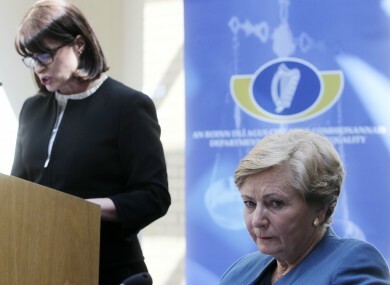 The Taoiseach Enda Kenny, Justice Minister Frances Fitzgerald and interim Garda Commissioner Noirín O’Sullivan have all apologised to the families in question on foot of the report. Fitzgerald also announced that her department would establish an implementation group to review its findings. Tanya Ward, Chief Executive of the CRA, noted: “The decisions to remove the children took place in a chaotic situation where everyone thought that they were acting to protect the children. But ultimately the Ombudsman for Children found that the gardaí had acted disproportionately and breached the constitutional rights of the families. Of particular concern is the finding that the children’s ethnicity featured in the decision-making. Ward said that the incident was “deeply upsetting for the two families and for the Roma community as a whole”. She added that the report raised a broader question about the discrimination faced by the Roma community “on a daily basis”. The Immigrant Council of Ireland said that An Garda Síochána and other State agencies must act swiftly to ensure that the ethnic profiling in the report “is never repeated again”. Denise Charlton, the Council’s Chief Executive, said that while Logan’s findings were “shocking”, her recommendations could act as “a blueprint to bring down the barriers which exist between many communities and gardaí”. Charlton described the report’s call for “improved interpretation and language supports, diversity training for all staff and proactive engagement by the [gardaí] to reach out to migrant communities” as “practical and urgent”. “Such procedures should be replicated in all our public services to ensure everyone is treated equally when in engaging with the State,” she added. Cultural awareness is a challenging area and, in a rapidly changing Ireland, it is essential that our approach is routinely scrutinised. He said that Tusla is in the process of reviewing what happens when a child is taken into care under Section 12 of the Child Care Act 1991. “In addition, a joint protocol between An Garda Síochána and the Child and Family Agency has been drafted which includes procedures for responding during and outside normal office hours. We are also working on enhancing information sharing through an electronic child protection register,” Jeyes stated. After it emerged that one of the families involved is taking a case against the State, Sinn Féin leader Gerry Adams said that the government “should not waste money defending [it]“. He remarked that the children were removed from their families due to “a racist and prejudiced opinion of the Roma community”. There appears to be no other reason for these children being taken away from their families, than that they were fair haired. DNA tests subsequently proved that the children were indeed members of their families. “This was a deeply traumatic experience for the families involved. It was an abuse of process and a direct attack on the constitutional and human rights of the children and their families,” Adams continued. Fianna Fáil’s spokesperson on Children, Robert Troy, said that the report’s recommendations needed to be implemented “swiftly”. “These families could have been spared the anguish and distress they were put through had the Gardaí more access to information held by the HSE with regard to the families at the centre of these cases. Labour TD Aodhán Ó Ríordáin said he hoped that the Logan Report would lead to a more tolerant society. Irish society has a road still to travel when dealing with matters of inequality and how members of certain communities are perceived. Unfortunately for many, the worst is often assumed of those from the Roma and Travelling communities and of those from lower socio-economic backgrounds. “We have much to learn from this debacle, and this report offers the outline of a brighter future for a more tolerant Republic if Irish society is up to the challenge,” Ó Ríordáin remarked. Email “'A wake up call': Where to now after the Logan Report?”. Feedback on “'A wake up call': Where to now after the Logan Report?”.